Are you struggling in choosing the appropriate audience using social media? Statistics reveal that 14% of Americans switch their mind about an issue because of something they perceived on social media. You should research the appropriate audience for the convincing process to buy the products or services will be easy. Evolving up with an exact strategy to choose the audience will help to build a strong online presence for the brands on social media platforms. Be precise when setting the goals you want to achieve. It takes time to generate traffic & increase sales on social media. At first, let’s gear up about entering into social media platforms for commercial purposes. The primary characteristics of the potential customers have to be identified to determine the perfect audience.For large brands operating across the worlds, choosing the customers from millions of people is a big deal. Building a buyer persona is an important chapter to be done in the marketing since the people are diverse. The personal approach is required to gain the attention of the customers. If your business is large and struggling to create the persona, then it requires dividing of the audience into smaller groups to build a persona profile for each. Though it requires more effort and time, the engagement would be better and you can save the time. It’s essential to understand the targeted customer’s social media inclinations. To achieve the milestone of success in social media, behavior & interaction with brands of the targeted customer is required. Referring to the famous quote “Your brand is a story unfolding across all customer touch points.” by Jonah Sachs the entrepreneur and designer. So analyzing the way the user or the targeted customer interacts with the brand is important. 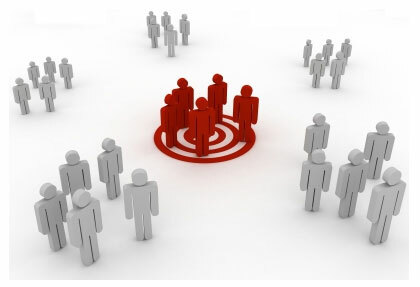 Nowadays, all social media platform has a search option used to find the target audience. Twitter has an advanced search option whereas LinkedIn allows you to search by names, email, keywords etc. Another tool used for estimating the size of the audience on Facebook is Facebook’s Business Manager. It enables you to conduct immediate market research. For example, if you want to reach women in Houston between the ages of 20 to 50 who love dark chocolate cookies, Facebook Business Manager will tell you that 50,000 users match your criteria. Now you can start working with the selected audience to generate leads. Another option is to begin by focusing on a narrower niche, examining different marketing strategies, and slowly showing your content to a wider audience. You should also consider social media tools like Hootsuite that integrates Facebook, Twitter, Instagram, LinkedIn, YouTube, and more that enable you to maintain multiple platforms in one place. You can research the prefered audience deeply by using relevant surveys in accordance over each audience category. ●	Include puzzles that will be compelling to your audience. ●	Three to five questions that take less than 2 or 3 minutes is more than enough for a survey. ●	Keep at least a couple of questions that let the audience say what they think. ●	Make participation more attractive, including special bonus, discounts that drive the user to buy the products. Despite the exponential growth of trending social messaging apps like WhatsApp, Telegram, Messenger, Viber, and WeChat, marketing specialists are not in a hurry to experiment with these platforms. According to the recent study of the buffer, only 20% of the marketers have utilised the messaging apps for marketing. You can stand ahead of the competitors by starting focusing on the messengers that allow users to have access to the brand to ask queries, buy goods & services, review etc. Once you are done with the survey results, it’s time to leverage that knowledge to build a stronger brand presence on social media. You need to develop a well created out content plan and social media calendar, including posts for holidays, sales, special offers, and other events. Scheduling the post by analyzing the time spent by the day users is essential. Promoting your stream of business is not a straight road since the platforms & user trends are changing day-to-day. With multiple experiments, you will get the knowledge of how it works, & every new marketing campaign will achieve the success rate. Hence you might have understood how to research your social media audience. Try to implement the above-mentioned tips and achieve the success rate of your business in digital space. Fazeela is a Digital Marketing Executive at Bright Bridge Infotech and she enjoys learning about the Digital Marketing field. She specializes in guest blogging, blog publishing, and social media. She is an avid reader and loves writing impeccable contents pertaining to digital marketing. She holds a bachelor degree in Engineering.